Justice Antonin Scalia's personal physician and sheriff's investigators said there were no signs of foul play, before concluding that he had died of natural causes. U.S. Supreme Court Justice Antonin Scalia died of natural causes and no autopsy was necessary, a judge has told The Associated Press. Chris Lujan, a manager for Sunset Funeral Homes in Texas, said the 79-year-old jurist's body was taken from the El Paso facility late Sunday afternoon and was to be flown to Virginia, although he had no details. Scalia's family didn't think a private autopsy was necessary and requested that his remains be returned to Washington as soon as possible, Lujan said. Presidio County Judge Cinderela Guevara told The Associated Press on Sunday she consulted with Scalia's personal physician and sheriff's investigators, who said there were no signs of foul play, before concluding that he had died of natural causes. He was found dead in his room at a West Texas resort ranch Saturday morning. Guevara says the declaration was made around 1:52 p.m. Saturday. Terry Sharpe, assistant director for operations at El Paso International Airport, said a private plane carrying Scalia's body departed around 8 p.m. EST Sunday. Scalia's body was accompanied to the airport by U.S. marshals, he said. The body was returned to Virginia late Sunday. Scalia's weekend death was as much of a shock to those at the ranch as it was to the rest of the nation. The owner of Cibolo Creek Ranch near Marfa, where Scalia died, said the justice seemed his usual self at dinner the night before he was found "in complete repose" in his room. John Poindexter told reporters Scalia was part of a group of about 35 weekend guests. He arrived Friday around noon. The group had dinner Friday night and Scalia was his "usual, personable self," Poindexter said. 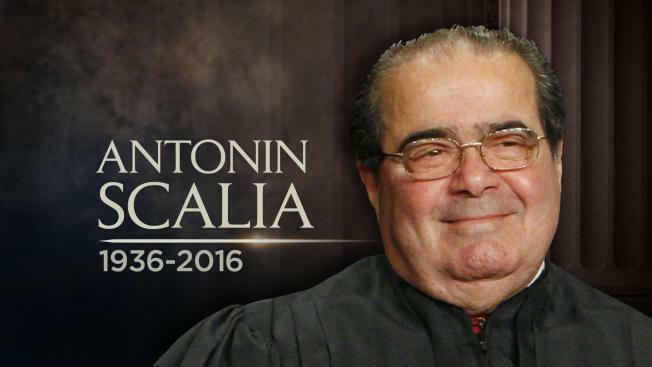 Scalia retired around 9 p.m., saying he wanted a long night's sleep, according to Poindexter. A procession that included about 20 law enforcement officers arrived in the early hours Sunday at the funeral home more than three hours from the ranch, Lujan said. Kristina Mills, a history teacher at nearby Chapin High School, came to the funeral home to pay her respects and brought flowers. "Recognizing his contribution to serving our country just compelled me to come," she said. "I wanted to do yellow roses because for him dying in Texas. I didn't want his family to have bad memories of Texas." In the nation's capital, where flags flew at half-staff at the White House and Supreme Court, the political sniping soared, raising the prospect of a court short-handed for some time. The Senate's Republican leader, backed largely by his party's White House candidates, essentially told a Democratic president in his final year in office not to bother asking lawmakers to confirm a nominee for the lifetime seat. Scalia's colleagues praised his brilliance and grieved his death. Justice Ruth Bader Ginsburg said she and Scalia "were best buddies" for more than 30 years. Justice Clarence Thomas said, "It is hard to imagine the court without my friend." President Barack Obama ordered flags to be flown at half-staff at the high court, where Scalia served for three decades, and other federal buildings throughout the nation and U.S. embassies and military installations throughout the world. While flags were being lowered, the campaign-year political heat has risen over the vacancy on the nine-member court. At issue is whether Obama, in his last year in office, should make a nomination and the Republican-led Senate should confirm that choice in an election year. Obama pledges a nomination "in due time." Senate Majority Leader Mitch McConnell, R-Ky., thinks it should wait for the next president. The Republican resistance to an election-year confirmation got a thorough public airing on the GOP debate stage just hours after Scalia's companions found him dead. Republicans argued that Obama, as a lame duck, should not fill the vacancy created by Scalia's death, but leave it to the next president — which they hope will be one of them. The Constitution gives the Senate "advice and consent" powers over a presidential nomination to the Supreme Court. Ted Cruz, one of the two GOP senators running for president, told NBC's "Meet the Press" that the GOP-controlled Senate is doing its job. "We're advising that a lame-duck president in an election year is not going to be able to tip the balance of the Supreme Court," Cruz said. But the top Democrat on the Senate Judiciary Committee, which would hold hearings on a nominee, said it would be "sheer dereliction of duty for the Senate not to have a hearing, not to have a vote." Vermont Sen. Patrick Leahy told CNN's "State of the Union" that he believes McConnell is "making a terrible mistake. And he's certainly ignoring the Constitution." Warren reported from Dallas. Associated Press writers Sarah Rankin in Chicago and Betsy Blaney in Lubbock, contributed to this report. AP videographer John L. Mone in El Paso also contributed.